When I was younger, cabbage wasn’t a favorite food of mine. Maybe you have the same problem with your kids too. But one way I would always eat cabbage is when it was in coleslaw. 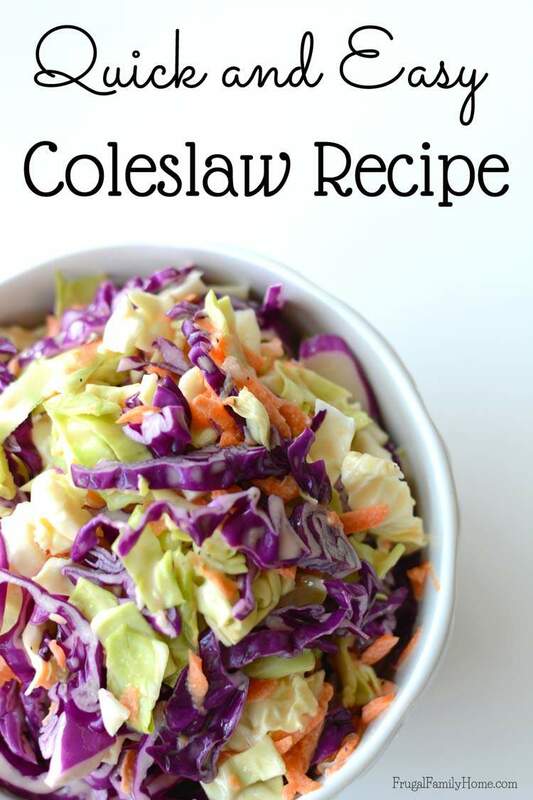 Plus making coleslaw is fast with this easy coleslaw recipe. My grandma and aunt used to make the very best coleslaw. It was so delicious. I’ve found recipes for copycat KFC coleslaw and I really like them, but I prefer the recipe that I’m sharing today. Its close to KFC but just a little less spice and slightly more sweet. I think because it’s the coleslaw recipe I grew up eating is why I like it so much. 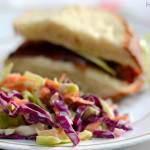 If you haven’t made coleslaw before, this is an easy coleslaw recipe to make. First you have to decide how you want the cabbage and the carrots cut up. I like to shred the carrots I add. To do this I use a grater, but you could also use a food processor if you have one. For the cabbage, I like to make diced pieces. But if you prefer the cabbage shredded that will work great too. I know at times I will cut the cabbage in small strips and then cut them into easy to eat lengths. But my favorite is more like the KFC coleslaw, cut up into diced pieces. For this batch I mixed the cuts on the cabbage. I diced the green cabbage and sliced the purple cabbage. I think it turned out great. To cut the head of cabbage, wash it and then remove any damaged or shriveled leaves. Then cut in half. Look for the core in the middle of the head and cut it out. I usually cut down one side of the core and then the other at an angle to get the core out. Then cut the cabbage into strips or dice. Place in a bowl, add the shredded carrots and toss to mix well. Now it’s time to dress the salad. 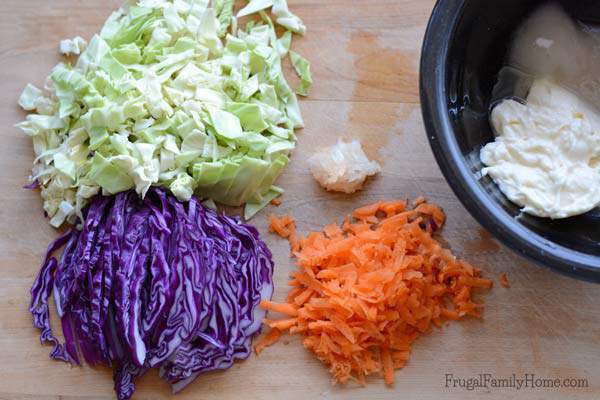 I mix the coleslaw dressing in a bowl and then mix it into the cabbage and carrots. Making sure to get the dressing distributed well. After the dressing is mixed in, I place it into the refrigerator to chill it. By waiting a few hours before eating the coleslaw, the dressing really mixes in the salad and really flavors it well. If you can’t wait a few hours before eating the coleslaw, that’s all right but the flavor will be better if you can wait. An simple and easy summer salad you'll love to make over and over again. This recipe has the perfect balance of sweetness with tartness. Shred or dice a half head of cabbage add it to a large bowl. In a medium bowl, mix together the mayonnaise, oil, vinegar, sugar, grated onion, salt and pepper. Mix well. 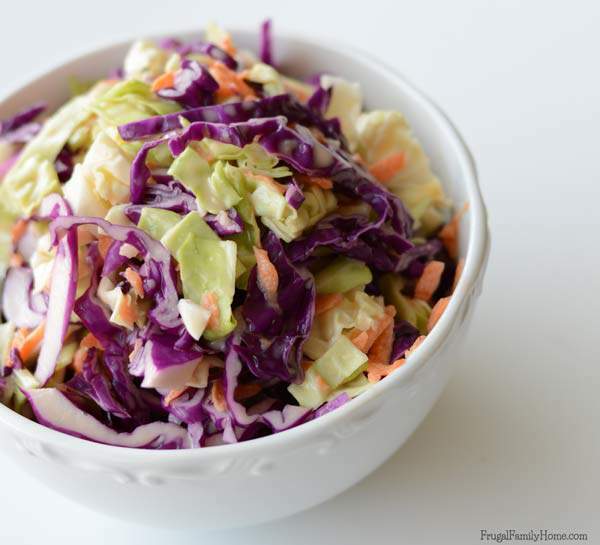 Pour the coleslaw dressing over the cabbage and mix until the cabbage and carrots are well coated with dressing. Serve immediately or refrigerate and until ready to serve. 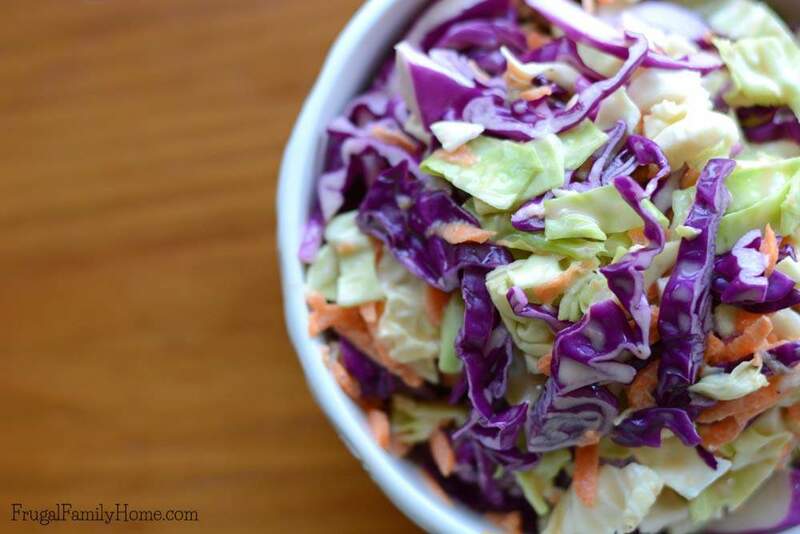 Coleslaw is a super easy side dish to make. It goes great with burgers or hot dogs. 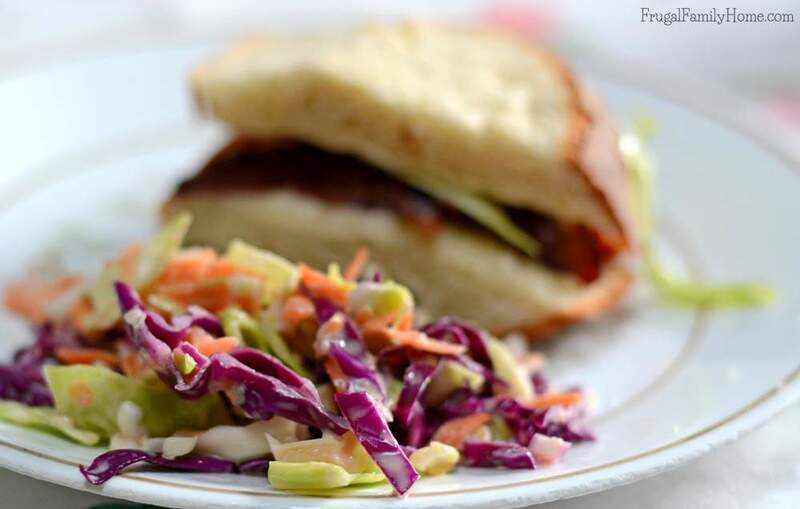 Coleslaw is also delicious on top of pulled pork sandwiches. Even though my son can be a picky eater, he will eat coleslaw. I hope your family enjoys this recipe as much as ours does. What’s a favorite side dish you make for summer barbecues? I’m always looking to try a new recipe. If you have a great one to share scroll down and leave it in the comments below. If you are looking for more side dish recipes be sure to check out my side dish recipe board at Pinterest.